Creating the right environment in your baby's nursery is so important and such an exciting part of preparing for your new arrival. As Poppy is our second child she will be moving into Isabella's old nursery when she is old enough, but there were some key changes I wanted to make before the that happened. As I've discussed a lot on my blog, Isabella wasn't a very good sleeper and didn't sleep through until she was 14 months old. Looking back I think some aspects of her bedroom didn't help, such as the squeaky wooden floorboards (making that Mission Impossible style exit even trickier) and the level of light. The squeaky floorboards weren't very easy to fix, but the level of light was with the help from Order Blinds. A family run business offering a vast range of different style made to measure blinds, perfect for every room. They have every colour, pattern and design you could ever want, along with excellent customer service and free samples with quick delivery. 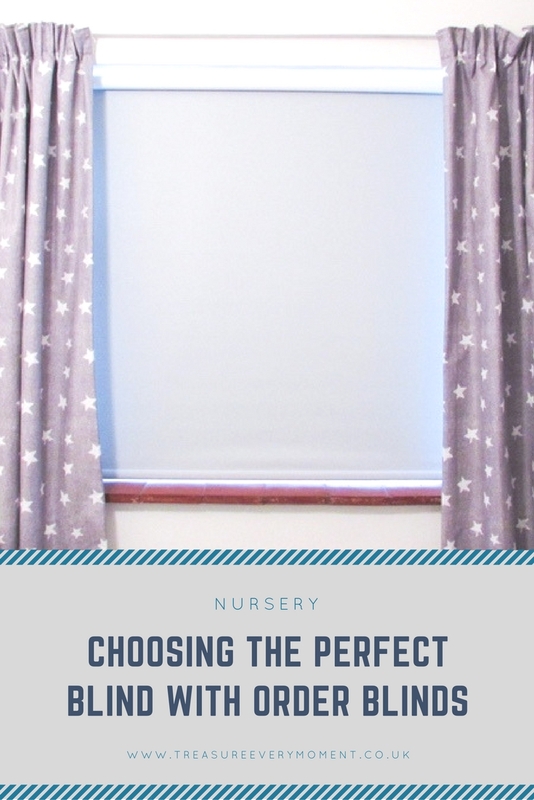 When it came to deciding which blinds to have in Poppy's nursery I was torn between having them match her turquoise cot bed or grey to match the nursery's décor. After browsing the Order Blinds website I settled on around four different blinds to order as samples. The delivery was fast, fuss-free and the samples were a really good size, allowing us to envisage what the blinds would look like in that colour/fabric/style. The four samples I went for were: Manhatten Mint Apple Made to Measure Roman Blind, Orla Kiely Two Colour Stem Powder Blue Made to Measure Roller Blind, Fog Thermal Plus Blackout Made to Measure Roller Blind and Misty Teal Blackout Cordless Roller Blind - Spring Loaded. So, a mixture of turquoise, grey and patterned blinds in order to really get a feel for what would look best in the nursery. Once the samples arrived I put them all up next to the window and left them there for a few days, so that that I could see them in different lights. After much deliberation (my husband and I are so indecisive!) 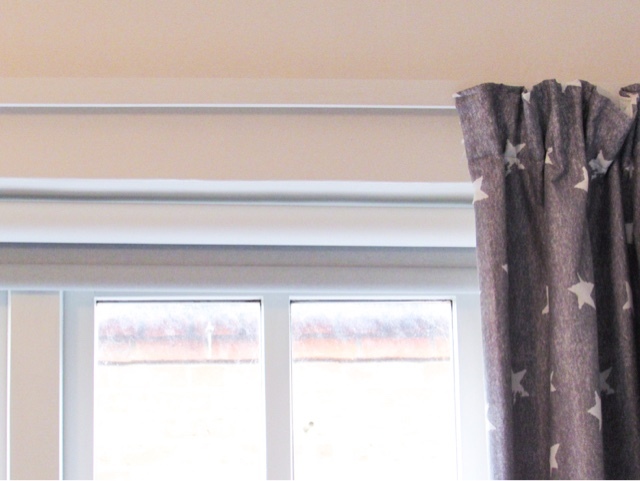 we settled on the Fog Thermal Plus Blackout Made to Measure Roller Blind*. There were a few reasons for this - none of the turquoise samples I had ordered matched the cot colour perfectly, the Thermal Plus feature appealed to us because we live in a cold old house and the fact it is a roller blind makes it very low maintenance (dusting it is very easy!). The Fog colour is a lovely light grey, which suits the room perfectly and helps to keep the small room looking spacious. 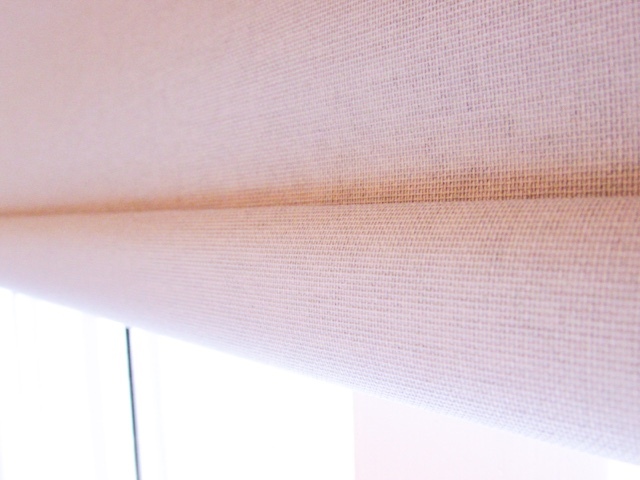 Throughout the process of choosing a blind you can easily find out how much it will cost using their 'Get a Quote' feature on each blind's web page. This is so convenient and easy to do, all you need is the size of the blind/recess area. There is no requirement to sign up to anything or enter your email address; it is quick and easy. 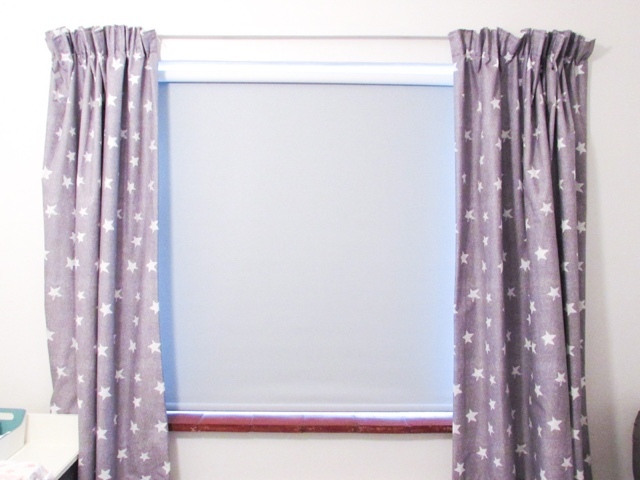 The window in Poppy's bedroom is 106cm x 106cm, which made the Fog Thermal Plus Blind £74. A very reasonable price for a made to measure blind that is not only blackout, but also has the benefits of Thermal Plus too. Order Blinds range of Thermal Plus Blackout Blinds have the addition benefits of white thermal backing to help reflect heat away from your windows, a uniform look from the outside regardless of the colour of the blinds on the inside and thermal benefits that help to keep the room warmer in winter and cooler in summer. It is therefore a really good option for children's bedrooms, especially if you live in an old house like me. 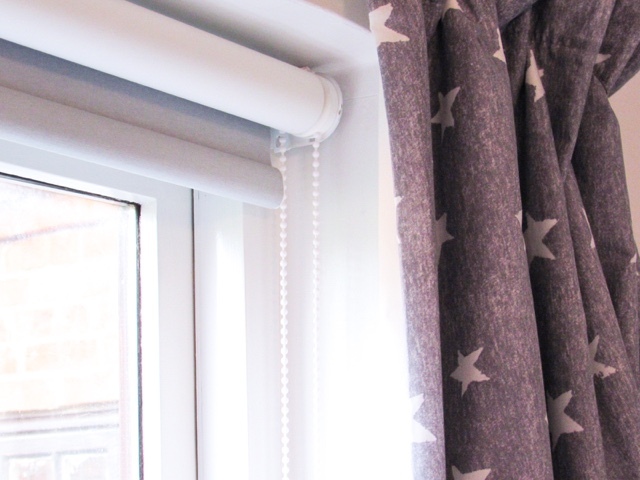 Other aspects of the blinds you can change is the control side, chain colour and what finish the bottom of the blind has. I decided to stick to the standard white chain because that matched the aesthetics of the room the best and keep the plain bottom finish. I also choose the control side to be on the right, which is the furthest away from the cot and changing mat. 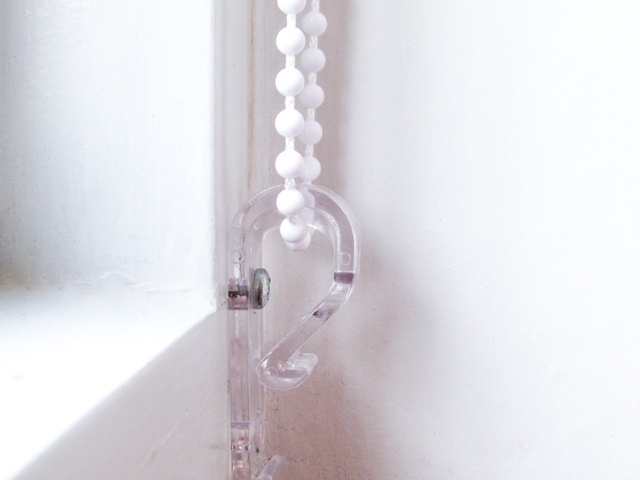 It is absolutely vital that blinds with cord pulls are kept away from children due to the risk of strangulation. 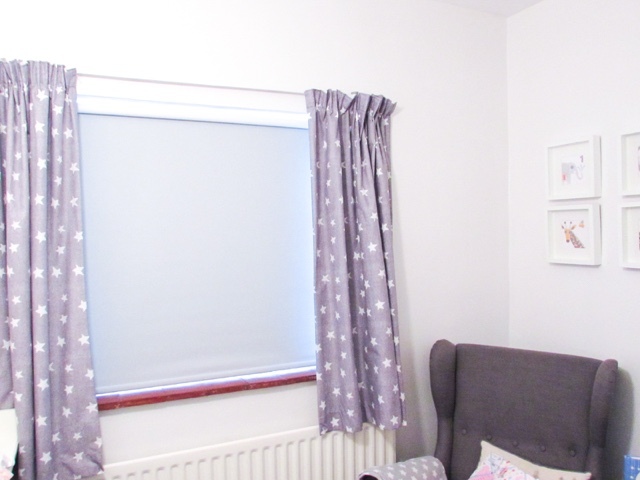 I am so happy with the look and finish of the blind; it is the perfect addition to Poppy's bedroom and helps to keep the room dark, making it an environment conducive of sleeping. What do you look for when buying a blind? Lovely blinds. Really nice colour. I struggled with our nursery as our window is nearly 3m wide (no, really! ), so trying to find a blind wide enough really cut down on our options. Having a blackout blind though was a must for me. This look like great blinds - having a thermal blackout bling really make all the difference when you have children in the house! Oh that is gorgeous! I like a black out blind, it's a real necessity with four kids who wake at the crack of dawn! Getting the right blind is really important to get that all important sleep. A blackout is a must for us! This looks fab! We desperately need a blind for our skylight in Caspian's room. It's not such a big deal now that it's getting darker earlier, but he's very sensitive to light and will generally only go down if it's pitch black. Will check out this company. The design looks lovely! Ah the blind looks great - never heard of thermal blinds before, what a great idea. Great shout going for the light grey - works perfectly with the curtains. These look good, blinds are so much better than curtains in a kids' room! These blinds look great. Great to see a quality product with so much choice of spec. Thanks for sharing.